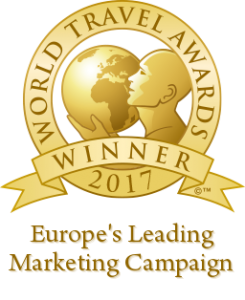 Today we’re very proud and excited to announce that the iambassador campaign #EuroFoodTrip in partnership with the Costa Brava Pireneu de Girona Tourist Board (Spain) and Apt Servizi Emilia Romagna Regional Tourist Board (Italy) has won an award at the World Travel Awards 2017. On Saturday night, Keith Jenkins (CEO of iambassador) and Nicholas Montemaggi (CMO of iambassador) collected the award for best Europe’s Leading Marketing Campaign with teams from Costa Brava Girona Tourist Board (represented by Jaume Marin, Gemma Suñer and Anna Cuadrat) and Tourism Emilia-Romagna (represented by Emanuele Burioni and Silvia Gagliardi) at an elegant award ceremony at the Museum of Ethnography in St. Petersburg, Russia. 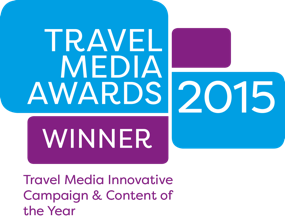 Considering that the World Travel Awards are the travel industry’s equivalent of the Oscars, this win is a significant milestone for both iambassador and for online digital campaigns. iambassador CEO, Keith Jenkins (middle); Emilia Romagna Tourism Managing Director, Emanuele Burioni (left of Keith); and Costa Brava Girona Tourist Board Marketing Manager, Jaume Marin (right of Keith). Silvia Gagliardi and Emanuele Burioni of Emilia Romagna Tourism. Jaume Marin and Emanuele Burioni celebrate this successful collaboration. The Costa Brava Girona Tourist Board team: Gemma Suñer, Jaume Marin and Anna Cuadrat. With votes for the award coming from travel industry peers, it is a special honour to receive this award for the ground-breaking #EuroFoodTrip that saw two competing destinations collaborate together, with iambassador, to present a new travel product and style of online content marketing. It is a model that has already been replicated in other campaigns, including the recent #EuroCityTrip, another iambassador project. iambassador hopes that this acknowledgment leads the way for more innovative influencer marketing campaigns in the industry. 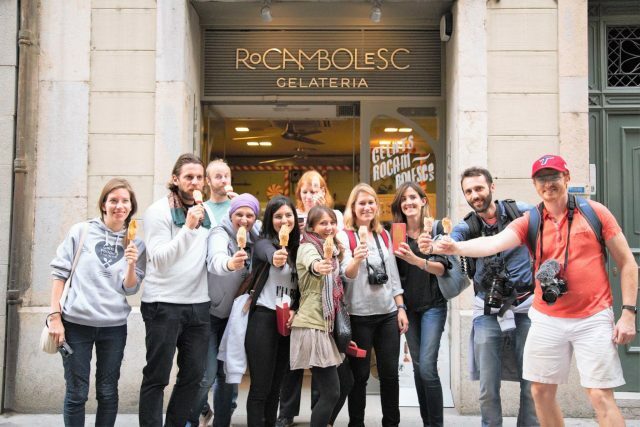 We would like to thank our partners Emilia Romagna Tourism and Costa Brava Girona Tourist Board, as well as the participating travel bloggers/photographers/videographers: Audrey Bergner, Samuel Jeffery, Anja Beckmann, Laurene Philippot, Brendan van Son and Emiliano Bechi Gabrielli. You can read more about the campaign here, and below you can watch the #EuroFoodTrip video by Emiliano Bechi Gabrielli, which has had more than 35,000 views since its publication less than a year ago. EURO FOOD TRIP | United foodies to taste the world from Emiliano Bechi Gabrielli on Vimeo. And last but not least, a very big thank you to everyone who voted for us – your support is truly appreciated!